Dubai Sep 16 (IANS) Bangladesh outclassed Sri Lanka by 137 runs in the opening match of the Asia Cup cricket tournament here on Saturday. Electing to bat first Bangladesh rode Mushfiqur Rahim s career-best score of 144 runs to post what eventually turned out be a pretty competitive total of 261 in 49.3 overs. Chasing what should have been an achievable target the Sri Lankan chase never really gained any momentum and they were dismissed for 124 runs in 35.2 overs. 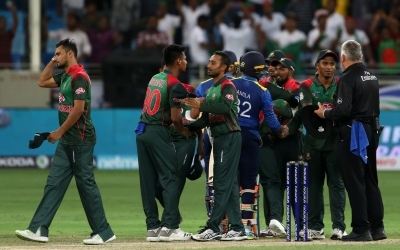 Bangladesh: 261 in 49.3 overs (Mushfiqur Rahim 144 Mohammad Mithun 63; Lasith Malinga 4/23) vs Sri Lanka: 124 in 35.2 overs (Mustafizur Rahman 2/20 Mehidy Hasan 2/21 Mashrafe Mortaza 2/25).